Established in 2014, the Ole Miss Bike Shop is home to the Rebel Pedals bike rental program. 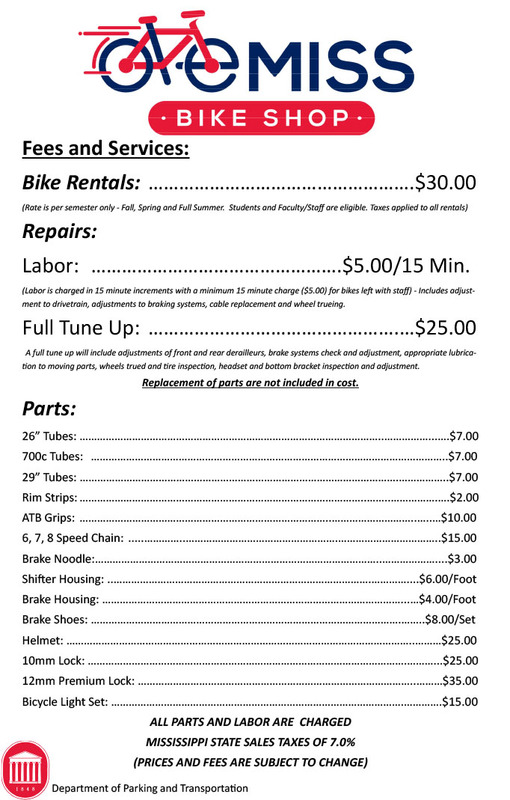 The Bike Shop is open to all students, faculty, and staff. Bring your bike in to get it registered, serviced, or rent a bike. A list of fees and services can be found below. Any student, faculty, or staff bringing a bike on to campus is encouraged to register it with the Department of Parking & Transportation. Registering your bike can help recover it in the event it is lost or stolen, as well as help the university determine the needs of bikes are being adequately met. Registration is free and valid for four years.